In today’s fast-paced digital environment, instant payments are a hot topic. Although some such schemes have been in existence for a number of years, momentum has picked up significantly since 2010 and the use cases for instant payments have become more tangible. But what is driving increased interest in these payments, what has changed and what does this mean for consumers, merchants and corporates alike? Moreover, are instant payments a Peer-to-Peer (P2P) instrument, or could they be used in the Business-to-Business (B2B) sphere too? In this article, we will outline the status of these schemes around the globe, with a particular focus on Europe given the imminent implementation of SEPA Instant Payments (SCTInst). We will also share the latest on HSBC’s mobile collections solution in India, which facilitates the instant transfer of funds. The term instant payments is often used interchangeably with immediate, real time, or near-real time payments. 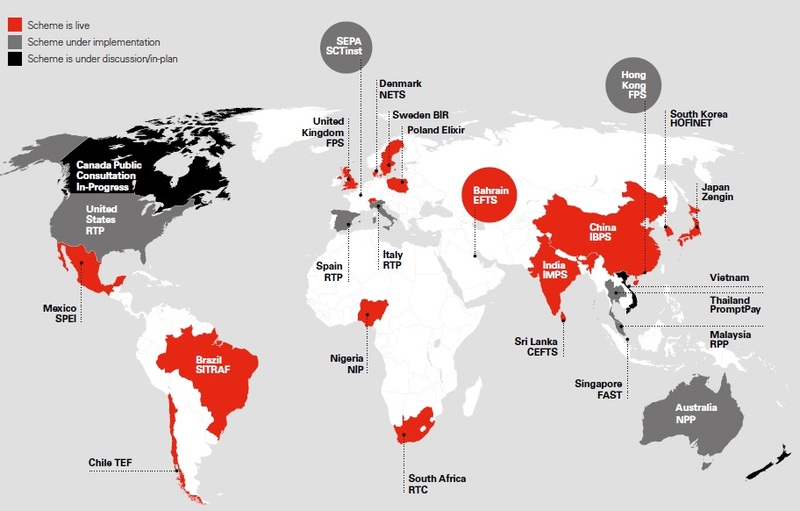 There are more than 18 existing instant payment schemes around the globe – and more being implemented. The majority of these schemes are based on 24/7/365 availability and are real or near-real time. In the case of the UK’s Faster Payments Service, there is a maximum two-hour cycle, but in practice most payments are credited within seconds. 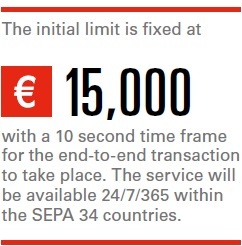 Whilst all current instant payment schemes are domestic, SCTInst1 when launched will work across the 34 SEPA countries, delivering the first cross-border instant payment service. 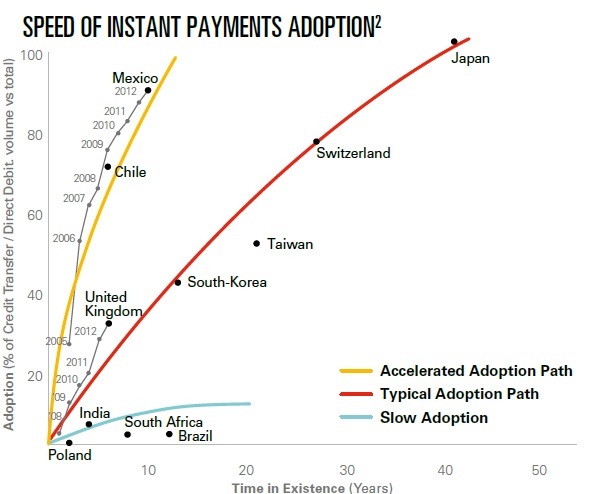 Adoption rates in countries where local authorities and regulators have supported, such as Mexico, have seen accelerated adoption of instant payment schemes. Whereas in Brazil, for example, instant payments are still only moderately used, even after 10 years. Looking ahead, the growth of digital and ecommerce marketplaces and the evolution of instant payment schemes, will lead to further momentum in the growth of instant payments. Participation in overlay or value added services. 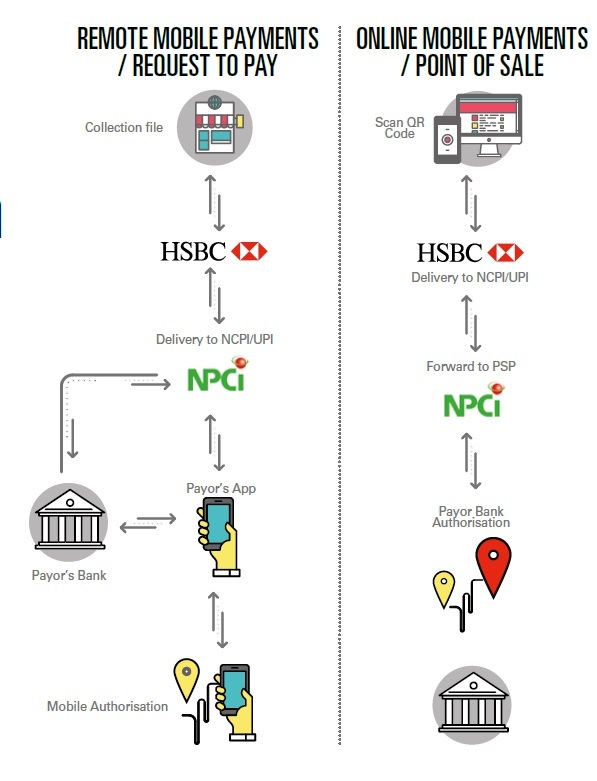 HSBC is already connected to many of these schemes – Japan, South Korea, Chile, United Kingdom, Mexico and, more recently, India. HSBC recognises the importance of these payments and has a global programme for implementation in a number of future schemes including the SCTInst scheme in Europe. In the UK, the Faster Payment Service (FPS) was launched in 2008, initially targeting consumers, but B2B transactions became an obvious next step. The initial transaction limit of GBP10,000 was pushed up to GBP100,000 to respond to the market demand which resulted in a strong uptake. More recently, this limit has been further increased to GBP250,000 – although individual banks and building societies set their own limits, which vary according to payment and account type, as well as customer segment4. 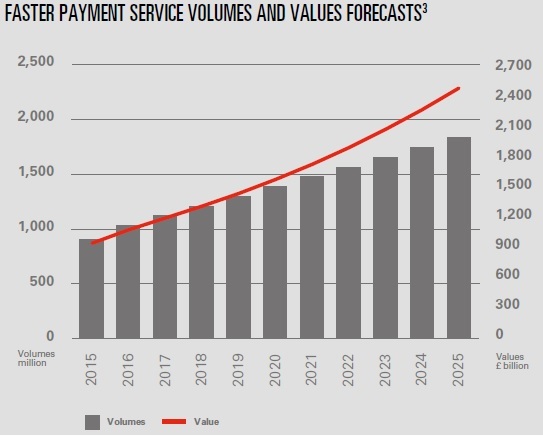 Between 2008 and 2015, the volumes of FPS transactions increased from 82 million to 1.2 billion illustrating the importance of this payment type3. Volumes are only expected to grow, with forecasts predicting more than 1.8 billion FPS transactions by 20253. This format decision was taken almost a decade ago, prior to ISO 20022 XML gaining global traction. However, it means that limited information is provided for reconciliation, with no return transaction codes, and these are so important in the B2B workflow. Consumer transactions represent the bulk of faster payments in the UK. In 2015, of the 903 million one-off transactions initiated by FPS, only 379 million were initiated by businesses. Currently, FPS usage by corporates tends to be for ad hoc payments. Payroll payments are under discussion, however, this will likely be for smaller payrolls, as corporates are used to sending such payments through BACS – which is not only cheaper but their employees are also used to having visibility of their incoming salary (e.g. on internet banking) the day before. In the P2P sphere, the most tangible use case of FPS in the market today is the Paym scheme, launched in spring 2014, which uses a mobile phone number to direct the faster payment to the beneficiary. Why the buzz around instant payment? The digital economy and the rise of mobile banking for consumers and corporates have provided a strong platform for faster payments, with an expectation that decision-making should be able to be done on-the-go. Professional life is now expected to echo consumer experiences. The exponential growth of mobile has further nurtured this expectation. This is not the only driver behind the rise of instant payments. Regulators are also pushing for these schemes to reduce the use of cash, as we have seen in India, and to help tackle financial crime and fraud. Equally, regulators are looking to provide greater access to payment services for under banked or unbanked consumers, as a means of social inclusion. Over time, the features of these schemes have matured and become increasingly connected to the digital economy. In Europe, the imminent implementation of the revised payments directive (PSD2) in January 2018, alongside the launch of SCTInst, will provide a strong impetus to opening up and regulating the digital economy in Europe. PSD2 provides the framework for Third Party Providers (TPPs) to enter the market and offer new services to consumers and corporates. These can either be Account Information Service Providers (AISP) or Payment Instruction Service Providers (PISP). These new actors are already operating today, but with the PSD2 regulation, banks, payment service providers (PSPs) and these new actors will be obliged to work together. In the case of PISPs, these new actors will be able to initiate payments on behalf of their customers, penetrating the P2P, B2C and the B2B space. The development of overlay services and direct access to nonbank participants is opening up the possibilities of using instant payment infrastructures in an economy where the end-user is looking for speed, certainty, convenience and security in their everyday transactions. Buying habits are evolving and there is a drive by corporates to create ecosystems within which their customers will adhere and buy-in to an ensemble of services. Once an instant payment infrastructure is in place, the real debate lies in the solutions and use cases that are available in the market and how to tailor the characteristics of these services to each customer segment. For consumers, speed is not the only consideration. Users of instant payments will be looking for ease of use comparable to cash, without the need for the payer to know the account number of the beneficiary. Costs must be competitive, and the solution secure. Additionally, certain demographics are yet to become comfortable with electronic payments or the internet and, prefer paper-based instruments. Yet there is a real drive towards alternative payments for those that embrace innovation, and these behavioral trends will open the way to new ecosystems for payments. For corporates, the priority is to provide options to customers in line with growing expectations, strengthening their brand and social image, while ensuring that – from a treasury perspective – instant payments are cost-effective and provide an alternative to existing models, hence an opportunity for propositions and services using instant payment schemes to grow rapidly. 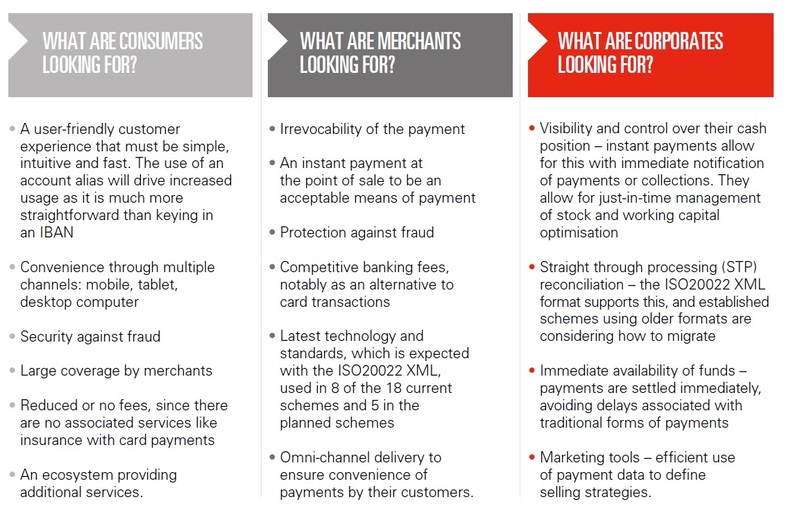 Elsewhere, the ISO 20022 XML format, available in some of the instant payment schemes, provides an added benefit for corporates from a data perspective. Artificial intelligence and efficient data mining are seen as the next step to developing business models, or entering new markets to further strengthen customer relationships. For corporates to adopt solutions built on instant payment platforms, however, organisational changes must also take place to provide the 24/7/365 service expected by the end-user. This is not just a system change that is plug and play. One of the most significant benefits of many of the instant payment schemes is arguably the use of the ISO20022 XML format. This provides data standards and richer remittance information to streamline and automate reconciliation. Moreover, security and fraud are already high on the treasurer’s agenda and their expectation is that these schemes will provide the right protocols to protect themselves and their customers. 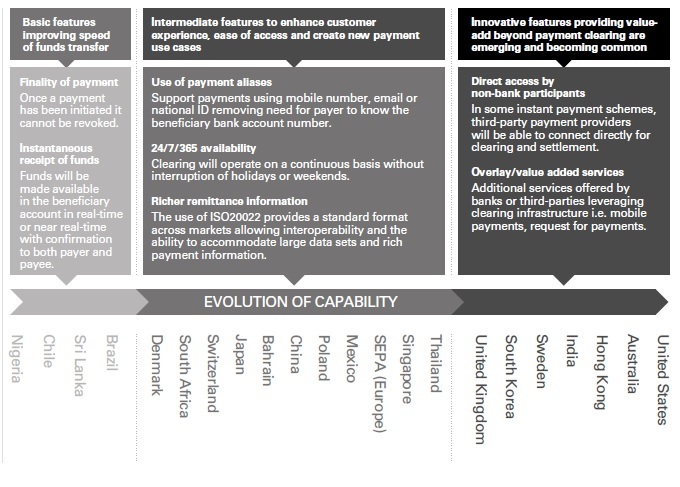 In summary, instant payments have much to offer corporate customers. A combination of speed of credit, irrevocability, better reconciliation, ease and convenience of use, will provide a genuine alternative to established models. The rise of instant payments will also accelerate the growth of solutions that respond to customer and corporate requirements to pay within seconds and be informed about transactions simultaneously. Such solutions are not only coming from the banking sector, but also from new third party providers. HSBC is leading the way, leveraging instant payments to deliver new services in countries like India. Recent changes in the payments landscape in India illustrate the potential of an instant payment scheme. 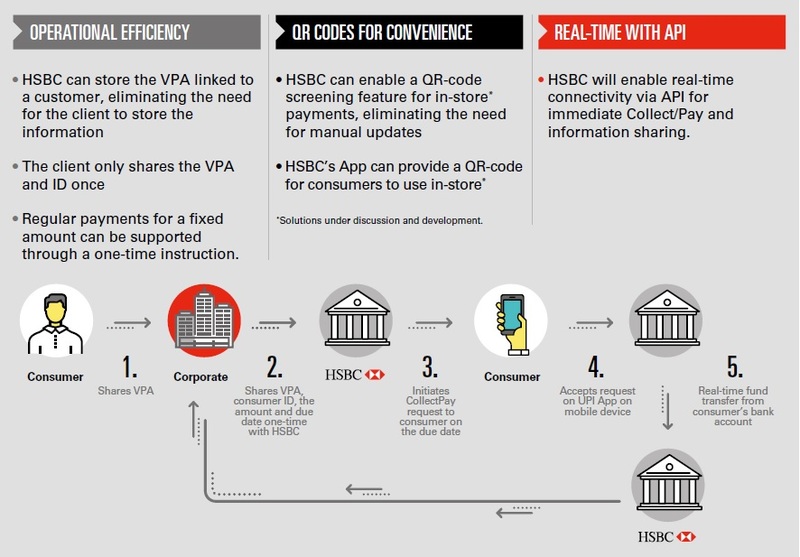 HSBC is one of the first foreign banks to provide a mobile collection solution in the country using the mobile phone – leveraging a mobile app that can be bank agnostic. India has the right conditions to introduce mobile collections for a number of reasons. The domestic market is broken down into services (60 per cent), manufacturing (16 per cent) and agriculture (24 per cent) with 65 per cent of the population still in rural areas. The continued trend of the rural population migrating to the cities is driving consumption growth. The telecoms sector has had real success with 80 per cent mobile penetration. In 2015, there were 1.05 billion mobile phones and 220 million smartphones in use6,7. Meanwhile, access to the internet is equally strong with consumers engaging with the internet and buying electronically. This has laid the foundations for consumer usage of mobile payments. At the same time, the Indian government is implementing multiple initiatives to ease access to bank accounts for the wider population and enhance the digital flow of transactions and communication. Some of the recent steps focus on digital modes of payments as opposed to cash, which has traditionally seen very high usage. Unified Payment Interface (UPI) is a next-generation payments platform, which facilitates the transfer of funds instantly between person-to-person and person-to-merchant using a smartphone. UPI can be used to send and receive funds. This platform allows both payer and payee initiated payments. What makes this platform transformational is its ability to give the user a platform to access different bank accounts, by way of a virtual payment address (VPA). The user can avoid disclosing actual account details and it operates 24/7/365. The platform is simple, convenient and interoperable (a single app may be used to link multiple accounts across banks). The current transaction limits are 20 transactions per day with a maximum value of INR100,000 per day. The first use-case that was implemented by HSBC India in November 2016 was specifically for recurring B2C payments. Since then, several other models have been implemented and although this is a young scheme, the market is very dynamic. New solutions are being investigated, such as using APIs as an information channel for invoice details, customer identification and soon, cheque collection.